Hi folks. Just returned from a very short, 3 mile run in the balmy 17 degree weather. Confession. Its the first run since I ran in the Buckeye Trail Winter Run. I would like to think my excuse was that my left knee (patella tendon) is a little sore..but to be honest, I just backed off the training and enjoyed strapping on the feed bag and eating everything in sight. 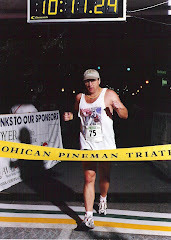 I am thinking of 2009 races. I have decided to try to get my full 50 k in the Fools 50k in early April. As I write that, my left knee is barking .Generally speaking...I will do more trail runs... about 3-4 sprint triathlons..and likely one Half Ironman. I am even thinking of a 50 miler. First however, I must complete the 50K before I go any further. I want to thank two authors for re-kindling my desire the past couple days. 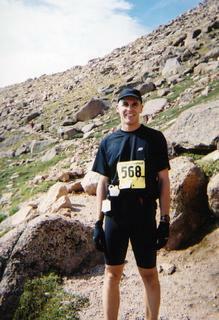 Jeff Horowitz wrote "My First 100 Marathons". I read that puppy in one day. Very interesting book on his experiences as he has run races all over the world. Its an introspective book too. New York Times writer Liz Robbins, whom I remember when she wrote for the Cleveland Plain Dealer has a great book that looks behind the scenes at the New York City Marathon. "A Race like No Other" Fascinating, how she details the exploits of the great runners, and follows some "average" folks who have real interesting stories. Her account of the Marathon as an event is so much more descriptive than a book that tells you how many cups of coffee are served before hand...if you get my drift. Both books are entertaining and motivating. Thanks alot!!! My buddy David Moss, who is the entertainment reporter at Fox 8 gave me the advance copy of "The Wrestler" and so The Bride and I watched it. I thought it was a tremendous movie. The general theme is.."what the hell do you do with your life, if all you've ever done is one thing".?? Can you break away from that life??? It spoke to me about people needing to have balance in their lives!!. Had a great time this week doing some coverage of the U.S. Figure Skating Championships here in Cleveland. Its amazing how much power these skaters have when they are launching themselves into the air. Fearless too!! Man, that ice is very hard ,.....and unforgiving. Discovered a blog this week Dirt Diva. Thanks Shannigans, for lettingme know about Catra. Very fascinating. This woman is an ultra-marathoner who is also really into Cross-fit. She's very spiritual, adventurous and tough. Basically, she lives the theme.."Live for THIS Moment". Thats it for now. I will check in early next week with a clearer picture of what events I will be doing. In the meantime...Happy Training. I'm glad you found Catra's blog! She is unique and an inspiration. Yeah, now that football is essentially over, I guess you have to move on to the next season of sports. I like that idea, kinda the same job but different topics. Glad to hear that the mental motivation is coming back. I always need a bit to 'want to do it' again. Your knee is barking? Have you tried giving it a biscuit? Both of those books look interesting, I will check them out. The Fools 50K might actually not have snow on it. Catra is an interesting person to follow. P.S. Thanks for your note on lentils. I will use them this week - they are 'up there' on the protein scale. A 50k now a 50 miler. You're a monster. Which half im are you thinking of doing? 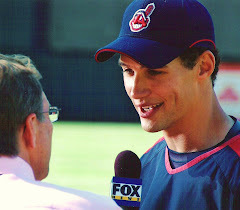 I was thinking of mussleman in mid July. Heard it's a nice race. I truely believe we need mental breaks as often - if not more ;) - than we need physical breaks. The books sound great -- I'd love to read them! The Fools 50k... sounds right up your alley! Hope you had a good time covering Figure Skating Natls. I went to spectate in St Louis in 06 and loved being there in person as opposed to watching it on TV! You have balance in your life..so important! Hey, it's good to get off the feet now and then. No worries. And I can't wait to see The Wrestler! Glad to hear you liked it!!! Way to get back on that 50K horse! You'll knock it out of the park. Catra's about the nicest girl you'll ever meet. She's definitely one of a kind. Skating is such a beautiful sport. I was just watching that the other day. Thanks for the coment on getting up before 5:00 am.